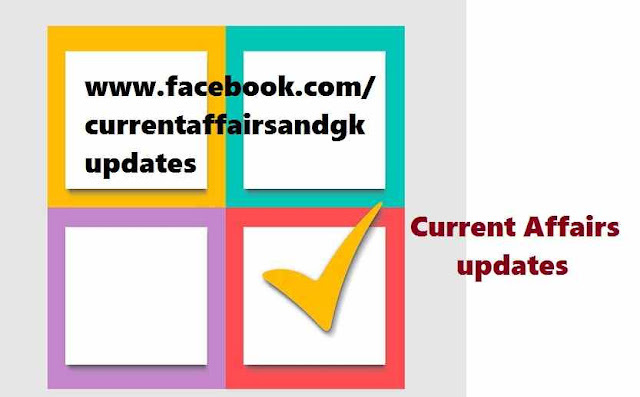 June 2015.These updates on current affairs helps you in various competitive exams.The updates are as follows. 1.Niramala Joshi well known as Sister Nirmala (81) who succeeded Nobel Laureate Mother Teresa as the Superior General of the Missionaries of Charity died in Kolkata. 2.AMRUT (Atal Mission for Rejuvenation and Urban Transformation) scheme was launched by Narendra Modi to develop 100 smart cities initially.Under this scheme some cities are selected from each state.Uttar Pradesh stand first in this list.13 cities are selected from this state. 3.The Income Tax (IT) department has put in a plan whereby tax refunds will be transferred to personal bank accounts as soon as it is processed and released.The IT department is also planning to fully use banking services to stop the current system of sending refunds of over Rs.50,000 via cheques through the Postal Department. 4.Finance Department reduced penalty for customs duty fraud by 10 percent.Section 28 of the customs act,1962 has been amended.It has been reduced from 25 percent to 15 percent. 5.DRDO scientist BHVS Narayana Murthy has been conferred with the Astronautical Society of India's Rocket and Related Technologies Award.Murthy is Associate Director of Research Center at Imarat of DRDO Hyderabad. 6.Pullela Sri Rama Chandrudu (88),Padmasri awardee,writer and scholar of Sanskrit and Telugu literature passed away. 7.Jwala Gutta and Ashwini Ponnappa,the most successful women's doubles pair of India stood in 13 the Rank in the latest Badminton World Federation Rankings. 8.Dr.G.Nageshwar Rao,CMD of LV Prasad Eye Organization is awarded with Life Time Achievement by Australian Alumni Association Trust. 9.President Pranab Mukerjee presented the Punyabhushan (Jewel of Pune) award to media personality Pratap Pawar. 10.Yevgeny Primakov (85),former Russian Prime Minister and Foreign Minister passed away.